Haiti appears to have had more than its fair share of political upheaval, misrule, poverty and natural disasters. And, as has happened so often in the nation's past, just when the situation was getting better, a fresh catastrophe struck, writes Nick Caistor. Until it was destroyed in the earthquake on Tuesday, Haiti's presidential palace was the most beautiful building in the capital, Port-au-Prince. Gleaming white, its imposing, harmonious structure was a symbol of the promise that has so often been dashed in this country of 10 million inhabitants. The palace is situated on the Champ de Mars, the huge open square down near the port area of Port-au-Prince. This is the centre of the city, where all the main administrative and community buildings are clustered. Many of them, including the cathedral, the main hospital, and the UN peacekeeping headquarters are reported to have been crushed in the worst earthquake to hit the country in more than 200 years. Hundreds may have died here, but the death toll is likely to be even higher in the nearby squalid slums such as Cite Soleil, where tens of thousands of the poorest Haitians live in wooden or tin shacks, with no running water, no sewage systems, and no electricity. Many of these slum dwellers have been forced to come into Port-au-Prince because, if anything, conditions in the countryside are even harsher. Serious malnutrition, Aids, and other chronic diseases are widespread. Haiti occupies the mountainous western third of the island of Hispaniola. When the Europeans first arrived more than 500 years ago, they were amazed at how wooded the country was. Now only some 3% of those original forests remain. The rest have been chopped down for lumber or for charcoal, which is still the most widely used fuel in the countryside. It is this deforestation that increased the havoc caused by a series of storms in 2008 , when almost a thousand people were killed and up to a million were made homeless after four hurricanes struck around the important town of Gonaives in as many weeks. In 2004, a tropical storm struck the northwest of the country. The historic port of Cap Haitien bore the brunt on that occasion, with an estimated 3,000 people killed. 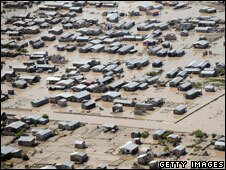 In addition to these natural disasters, Haiti has suffered throughout its history from political turmoil and misrule. 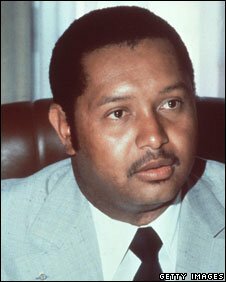 When 'Baby Doc' Duvalier was forced from power in 1986, it seemed as though the country might finally enjoy a period of democratic rule. 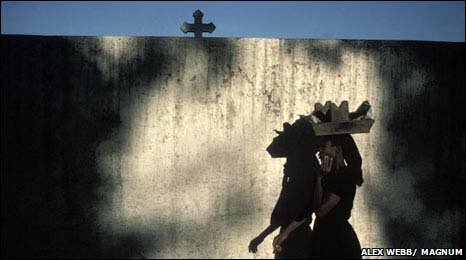 After several years of unrest, this new hope was symbolised by the election in 1990 of a young former Catholic priest, Jean-Bertrand Aristide. But his period in office came to an end after only a few months, when army colonels seized power. The democratic experience was cut short, several thousand people became victims of the new regime, and thousands more tried to flee the country on home-made rafts. It was the huge influx of these boat people into the United States in 1994 which helped persuade President Bill Clinton that the time had come to kick out the colonels. Once again, Jean-Bertrand Aristide returned to power, and a new, more promising political era seemed about to begin. Under his rule, and that of his successor Rene Preval, and with the help of the United Nations and other international aid organisations, life improved a little, although Haiti remained the poorest country in the Western hemisphere, with average income of less than two dollars a day. It was when Mr Aristide was elected president for a second term in 2001 that the political situation began to slip back into confusion and growing violence. 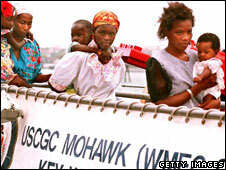 Refugees were often picked up off the coast of Miami in the early 1990s. President Aristide was forced out of power early in 2004, after several months of increasing political turmoil. A UN peacekeeping force of 9,000 has been in Haiti ever since, trying not only to bring stability but also to help build roads and other vital infrastructure projects. Mr Clinton, now a UN special envoy, has spearheaded attempts to get international donors to live up to their promises of aid. Under Rene Preval, who was elected for a second term in 2006, there has been a small but significant improvement in conditions in Haiti: jobs have been created, the slums have become less violent, and there have been some timid signs of a growth in tourism. Now, as has happened so often in Haiti's past, the fresh hopes have been extinguished. It will take a massive effort from the United Nations and the international community simply to rescue the thousands of victims and clean up after the earthquake. Speaking after the 2008 disasters, President Preval said that Haiti needed long-term help if it were not to be "left as always, truly alone, to face new catastrophes". Across the Champ de Mars from the presidential palace in Port-au-Prince is -or was - a tall statue to the maroons, the runaway slaves who are the symbol of Haiti's fight for independence at the end of the 18th century. Haitians will need the same spirit now if they are to overcome this latest blow to their nation.